Many students come to Mathnasium nervous about math tests. 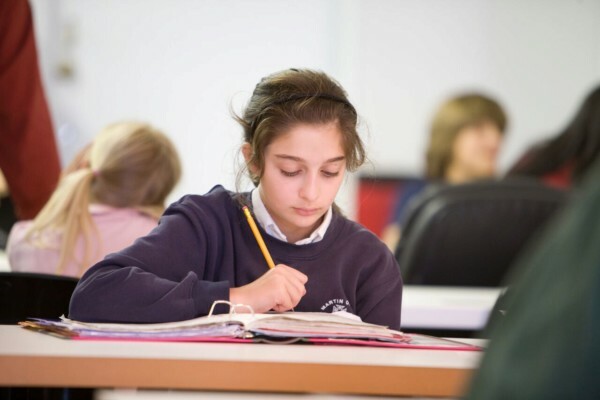 We’d like to share a handful of our study tips to help you tackle each test performing at your personal best—in math, and in your other classes too! Preparing for a math test (or any test, really) is a marathon, not a sprint. Cramming does not work—the best advice we can give is to do your best to stay on top of your school work and what’s being covered in math class. Believe it or not, homework is your friend! Tackling these smaller assignments head on is essentially the best way to get the ongoing practice and exposure to the material you need to do well. Most importantly, it’s an opportunity to get real with yourself and truly see what you know and what you don’t. And seriously—the worst that can happen as you plow through your math homework is discovering you don’t have a solid understanding of what’s been covered in class. That is completely, totally, and utterly fixable. It won’t happen overnight, but with your commitment and dedicated effort over time, it is entirely possible for you to strengthen your math foundations and number sense so you have the prerequisite knowledge and mental flexibility you need to master what’s being taught in class today. And most importantly, if at any time during the studying process you feel like you need math help, ask for it. Make sure you’re clear on the scope of the material covered on the test. This will help you craft the most efficient study plan possible. Assess your home study space. Is it an area where you feel you could be productive? Create a study space that encourages productivity and focus. Get organized. Schedule in as much regular study time as you need for the test without compromising your other academic priorities. Give yourself enough time per allotted study period to sit and really get into the material without distraction. Revisit old assignments/homework/quizzes—chances are that you’ll see similar questions in a similar format in front of you once test time rolls around. At the same time, be prepared to see concepts presented in a different way. As an example, “parts of a whole” can be presented as fractions or as percents! Flex those math muscles by regularly doing practice math tests or a variety of practice problems. Tip: Our brains function differently at certain points in the day. If possible, try to do some practice math problems during the same time of day your test is scheduled. If you’re the type that thrives on brainstorming and can truly be productive when studying with peers, gather with a (small and manageable) bunch of classmates and form a study group! Tip: Come to study group meetings with a set of questions you don’t quite understand. A friend’s explanation may be just what the doctor ordered to trigger that “aha!” moment when something tricky finally makes sense! Help your classmates out—explaining the reasoning behind math problems benefits you, too! More solitary types may be happier studying solo. Be mindful about staying on task and don’t be afraid to reach out to classmates, teachers, family members, and other resources when you need help! Make enough time for fun! We’re serious. This keeps you in high spirits and prevents burnout and needless frustration. We’ll say it again: cramming doesn’t work! The good news is, if you’ve been studying consistently in the weeks leading up to the test, you’re most likely on track to do well. So, give your notes a quick read-through if it makes you feel more at ease, and then do what you need to do to chill out—activities that make you feel happy and relaxed. Double check the contents of your book bag. Do you have everything you need? A working pen? A calculator (if required)? Make sure everything is organized and in order so you’re not tearing up your house in search of sundry but necessary school supplies the following morning. Tip: If your classroom doesn’t have a wall clock in plain view, bring a watch—it’ll help you manage your time. Jumpstart the day with a balanced breakfast with enough protein to give you energy to carry you through the morning. Avoid sugary breakfast treats—the inevitable sugar crash could very well derail your energy levels as the day progresses. However, don’t eat or drink anything you wouldn’t usually have—if you are not a coffee drinker, this is not a good time to start! Bring a selection of healthy snacks with you as well, so you have something on hand should you need a little pick-me-up. Use the restroom before heading in to take the test. Relax—take a deep breath and think positive thoughts. You got this. Read the test. Read it carefully and thoroughly, from beginning to end, so you know what’s expected of you. This is especially important if your test contains a lot of word problems. A careful read-through will also help you catch so-called “trick” questions before they catch you! Follow instructions. “Show your work” means … show your work. Budget your time wisely and set priorities. Breeze through easier questions and save the bulk of your allotted time for questions that require heavier lifting. Be mindful of questions that may earn you more points than others. Keep track of time as you work through the test. Stay focused and on task. If you finish ahead of time, double check your answers. Tip: Neatness counts! A correct answer won’t get you anywhere if your “6” looks more like a “8”. Also, be on the lookout for careless mistakes you may have made. If you’re short on time, don’t panic. Do your best and answer all of the questions to the best of your ability—there may be possibilities to earn partial credit. The only exception to this is in situations where you could lose points for incorrect answers. Use your best judgment. CELEBRATE! Regardless of the end result, you worked hard and did your best. Treat yourself! What’s your number one math study tip for tests?